Vegan Stephen: Vegan Sandwiches at a Tech Conference? Vegan Sandwiches at a Tech Conference? 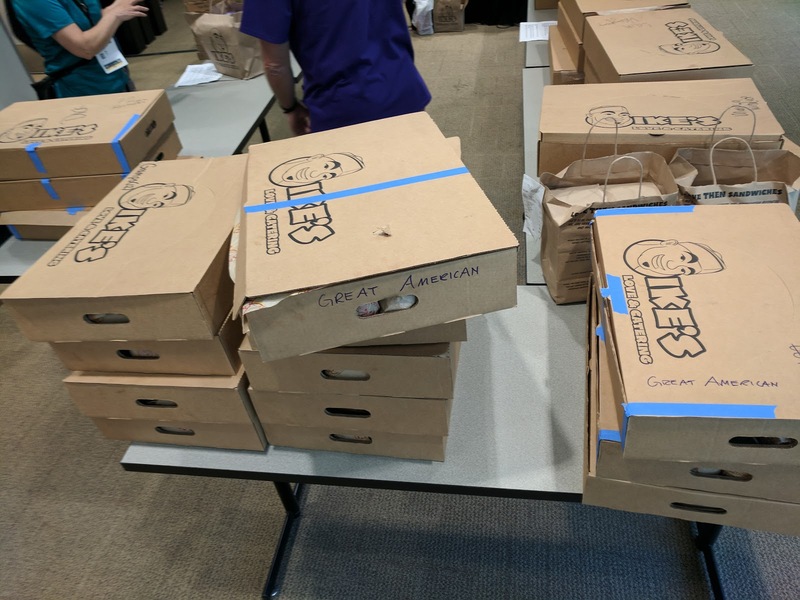 This year the organizers of Silicon Vally Code Camp asked attendees what kind of food we wanted for lunch. I took the opportunity to recommend some vegan options, and they graciously asked me for some guidance. 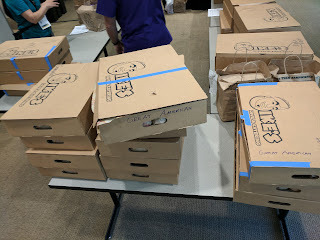 We ended up with over a 140 Ike's Place vegan sandwiches! I helped hand them out and I learned that there are some vegetarians who find fake meat (tofu "chicken," Tofurky) repulsive. So tomorrow we're going to get some vegan sandwiches without fake meat, and hopefully make them happy, too. Imagine being the go-to person to decide on vegan options for a conference! The power! I would have been very happy with the mock meat options - for one thing, it's delicious, and for another it's a change from the ubiquitous hummus and veg. I wish hummus and veg were ubiquitous! Around here it's all meat and dairy. Awesome! Now I'm doubly jealous because it's been so many years since I was last at SVCC. Was at NodeSummit in July and when I asked about vegan options to one of the facility staff he just laughed. I think we went to Garden Fresh that time. I did miss customarily stepping out for some local San Jose grub. But the conference is now entirely indoors, air conditioned, and concealed from the sun. Vegan Sandwiches at a Tech Conference, Again?